So with Jenna's log giving us three posts and mine already on site serving as the short beam beside the shipping container, we still need the long 9m beam supporting the half trusses beside the rammed earth wall, and posts to support it. 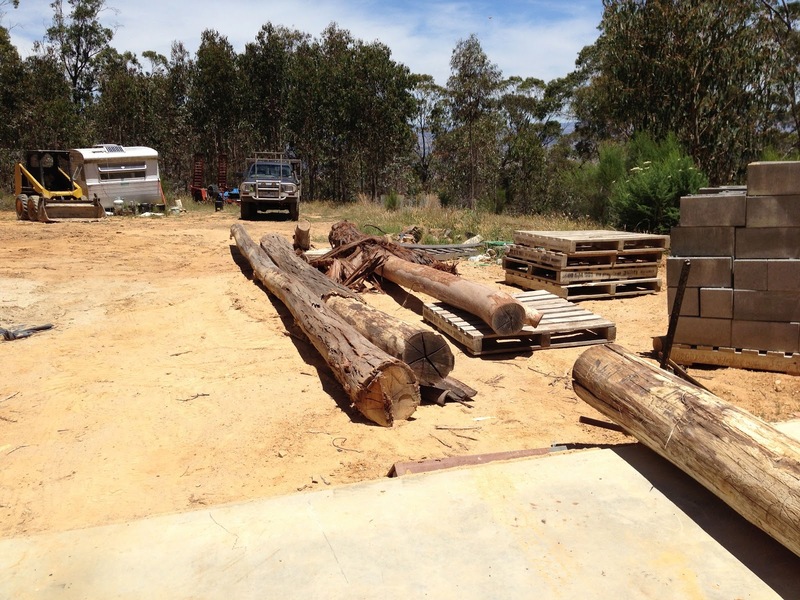 A year or so ago I walked around the property looking for suitably straight trees of the right diameter, and found a blue gum which was just about perfect - 350 to 300mm in diameter, as straight as you'd like and a good 14m long to the first fork. I always have mixed feelings felling trees, especially beautiful tall, straight ones such as this. I'd much rather leave them standing and appreciate them from the ground but in this case, I'll get to appreciate it far more frequently and up close as it forms part of our building. Anyway, this log has been left to season where I felled it and so today's job was to cut it to length and bring it down the hill to the house site. Peter was here to lend a hand and between the two of us we managed it easily - Peter with the straps and chainsaw, and me in the bobcat dragging them down the hill backwards. So here we have them, a full complement of logs for our post & beam framing. Until today I'd been unsure how we were going to erect these frames. I'd spoken to a crane operator from Seymour who came out to have a look at the site, but he would have been unable to get his truck in and out and so reluctantly passed on the job. His recommendation was to hire a Franna crane - one of those wheel-at-each-corner, centrally articulated cranes you see on the roads - but while we had the bobcat running today I thought I'd try a little experiment. As it happens, I was able to safely and successfully lift one end of the long 10m log pretty much to the full lifting height of the bobcat, which is easily over 3.0m without the machine feeling anywhere like it wanted to tip forward. I was fully prepared to wind up hanging from my seat belt but there was never any risk. So, it looks like we have the solution to these frames. 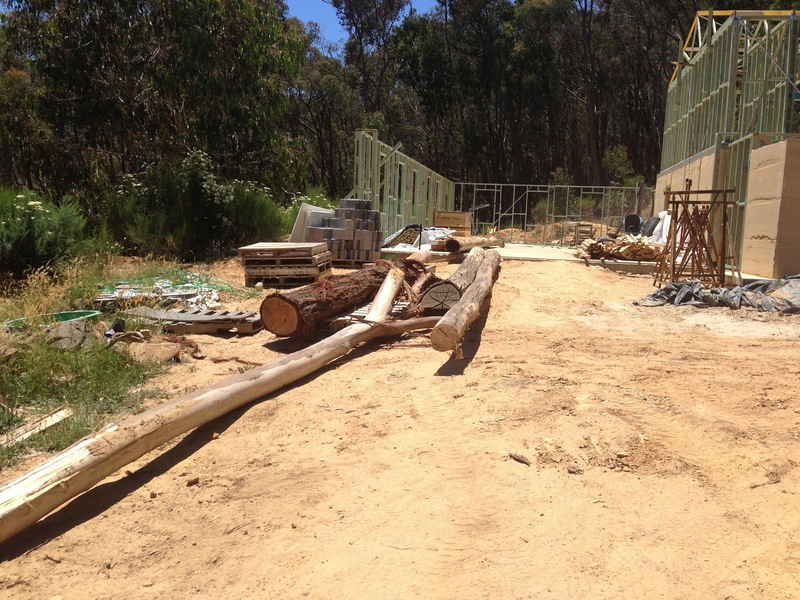 We'll use the bobcat to erect the posts, fix them into position and brace in three dimensions, then lift the beam into place one end at a time. The plan is to get stuck into these next week, after Christmas.